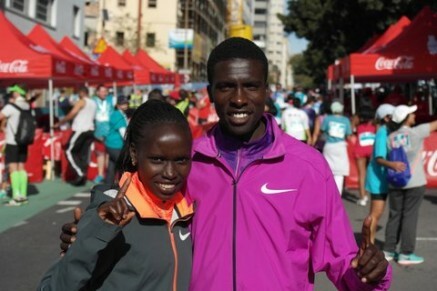 At the inaugural Cape Town Run 12k former World Champion Vivian Cheruiyot (KEN) showed that she is returning to fitness with a commanding victory. Pushing on from the start Vivian built up her lead throughout the race crossing the line in 38:27 nearly a minute ahead of second place. The mens race was the complete opposite as Emmanuel Bett (KEN) had to battle all the way to the line to take victory by the narrowest of margins in 33:32, the same time as the runner up and an agonizing one second outside the World Best time for the distance. Timothy Toroitich (UGA) also took a place on the podium in third. At the opening IAAF Diamond League event in Doha Mo Farah (GBR) began his season which will see him defend both his world titles with a second place over 3000m. Jeremiah Mutai (KEN) ran a seasons best of 1:45.50 over 800m. At the second round in Shanghai Magdalyne Masai (KEN) dipped inside 15 minutes for the first time taking 7th in the 5000m in 14:58.54. European silver medallist Matthew Hudson-Smith (GBR) opened up his outdoor campaign in fine style with a convincing win over 400m in Gavardo. Matthew timed 45.79 for his fastest season opener. Commonwealth Champion Kemar Bailey-Cole (JAM) and Jamaican teammate Mario Forsythe (JAM) both took second places in their respective 100m races. Kemar timed 10.22 seconds in the Cayman Islands and Mario 10.26 seconds in Jamaica. Finally, just 3 weeks after the Hamburg Marathon Micah Kogo (KEN) finished 4th in a high quality race over 10km in Bangalore.